My children's paternal grandmother, Lily, passed away, much too young, right before Christmas of 1981. Amy was 7 and Chuck was 5. It was a heart wrenching experience. My first experience with death of someone to whom I was very close. A death that my children and their cousin had to learn to cope with at their young ages. Lil was not just a second mother to me but a very dear friend. She was the best grandmother I had ever met. That's saying something because my grandmother and mother were pretty darn amazing. I strive to be half of the grandmother that she was to Jennifer, Amy and Chuck. When those children were at her house, nothing else mattered. She spent time with them; reading, talking, playing games, going for walks, taking them shopping. They were never a bother and never a burden. Her face lit up each time one of those kids walked into a room. 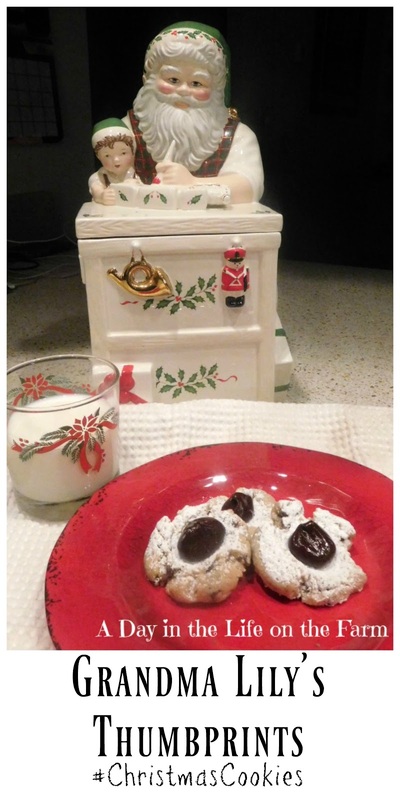 Each Christmas, Lil would make Thumbprint cookies. 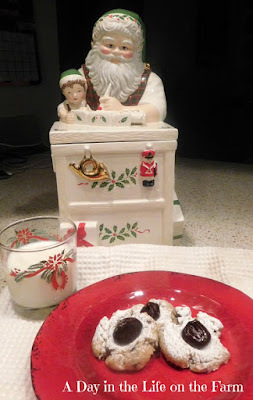 They were my kid's dad's favorite cookie and I was soon making them each year as well. My kid's grew up, their dad and I separated and we began a new chapter of our lives with Frank, Anthony and Nicole. I continued to make Thumbprints, Amy's favorite, and Brown Eyed Susans, Chuck's favorite but expanded my repertoire to include Frank's favorite, Mom Klik's Almond Cherry Snowballs and Sugar Cookies for Anthony and Nicki. When Amy got her own place, she took over the making of the Thumbprints and still makes them each year for her Dad. I hadn't made them in years but this season, my mind and heart have been heavy with the losses that always seem so much harder over the holidays. In two day's I will be remembering my brother, Dan, who died on December 10th, way too soon. He was the same age that I am now. December 13th is my mother's birthday, she died shortly after Christmas 2015 and my mother in law, Jane, died one month and one day later. This is our second Christmas without them. The house is no longer filled with my Pop's laughter and my nephew, Danny, has been missed for many years now. I was feeling pretty darn sorry for myself but then Tuesday came. Tuesday's I have my granddaughter. So I made sure my face lit up when she entered the room and then I took time with her. She helped me make these cookies that hold such fond and happy memories. I pray that, one day, these memories will help her to get through the rough spots that she will encounter in her life. In large bowl of stand mixer, fitted with the paddle attachment, cream together the butter, salt and vanilla. Mix in the brown sugar and gradually blend in the flour and milk. Stir in the mini chocolate chips. 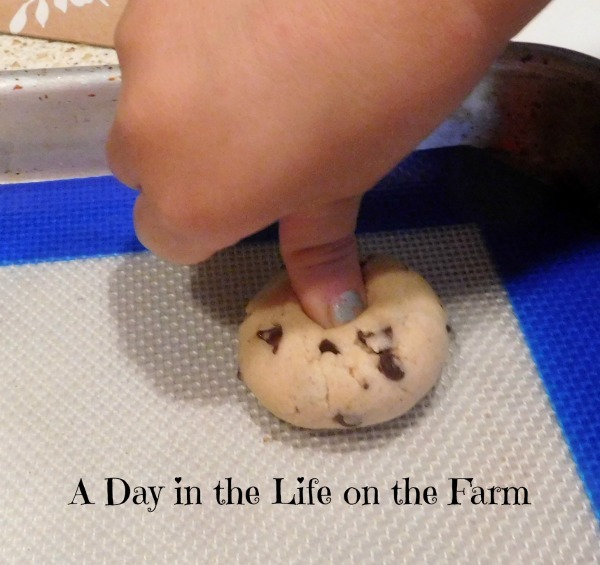 Form into 1" balls and place onto a baking sheet lined with a silicone mat or parchment paper. Make an indentation in each ball with your thumb. Bake in a preheated 375* oven for 10-12 minutes. Remove to a wire rack placed over parchment paper and generously sift powdered sugar over them. Let cool completely. 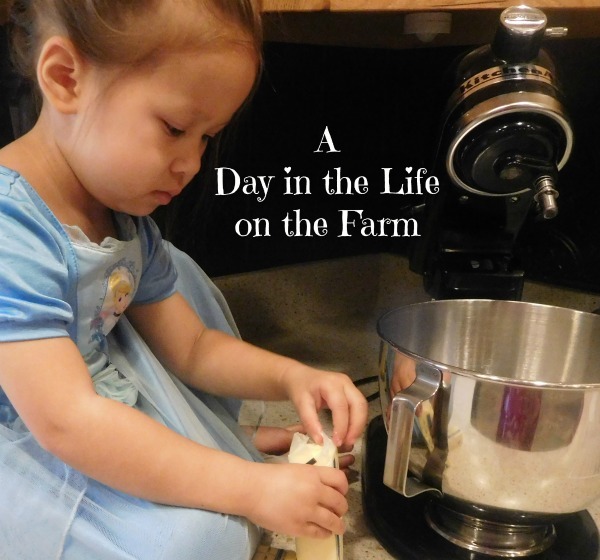 It's awesome to make memories with your kids and grandkids, especially in the kitchen making memories. My thoughts are with you...the holidays are hard sometimes when you miss the people who aren't there. I too lost my brother Matt three years ago...I'm not sure it ever gets any easier. I do love though that I can always think of him when I'm baking and know that he would have loved something or totally hated it. He was never afraid to hurt my feelings and if he liked something you knew it was good! These thumbprint cookies look like something he would have loved!!! Thanks Colleen. Losing a sibling is (for me) the hardest loss thus far. You know that your parents are probably going to pass away before you do but you aren't expecting to lose a nephew or brother. My thoughts are with you during the extra difficult holiday season. I think about my mom quite a lot between Thanksgiving and Christmas. It's been 8 years now since we lost her. The pain gets easier to bear, but the loss is always there. I'm so very glad you have these bright days with your sweet granddaughter to make new memories and share these lovely traditions with. Thanks Rebekah. I know that I'm not alone missing loved ones during this time of year. I'm a blubbering mess over here. Such a beautiful story about your first MIL. I try to be at least half that kind of grandmother too. If they want ice cream for breakfast, that's just fine! May you recreate the memories you have and be the grandmother and mother that you are missing so much right now. Thank you Karen, it helped me to write it all down.